꽝꽝나무는 전라북도의 변산반도와 거제도, 보길도, 제주도 등에 분포하는데 잎이 탈 때 ‘꽝꽝’소리를 내며 타기 때문에 이런 이름이 붙여졌다. 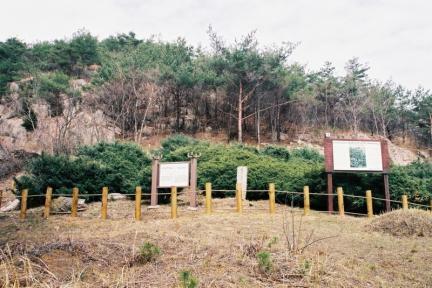 정원수·울타리·분재 등 미화용으로 이용되고 있다. 부안 중계리의 꽝꽝나무 군락은 산 위쪽의 다소 평평한 곳에 형성되어 있는데, 과거 기록에 의하면 약 700여 그루가 모여 대군락을 형성하였다고 하나 지금은 그 수가 크게 줄어 200여 그루 정도만 남아 있다. 꽝꽝나무 군락이 있는 이곳을 잠두(누에머리)라고도 부르며, 풍수지리적으로는 명당 자리에 해당한다고 한다. 부안 중계리의 꽝꽝나무 군락은 그 분포상 꽝꽝나무가 자랄 수 있는 가장 북쪽지역이기 때문에 천연기념물로 지정하여 보호하고 있다. 또한 이곳의 꽝꽝나무는 바위 위에서 자라고 있어 건조한 곳에서도 잘 자라는 군락이라는 점에서도 큰 가치가 인정되고 있다. 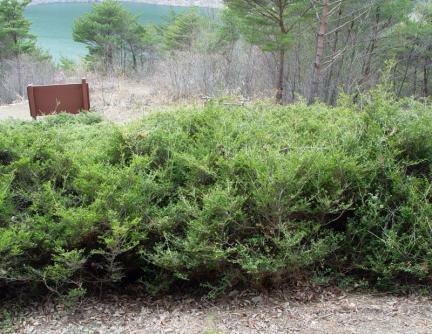 The Box-leaved Hollies are distributed in Byeonsan Peninsula, Geojedo Island, Bogildo Island, and Jejudo Island. 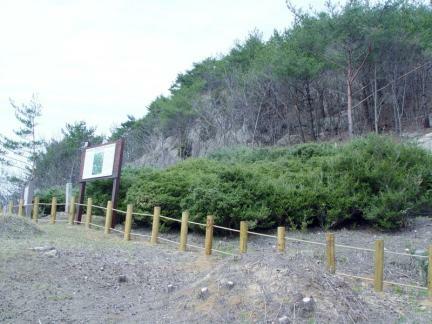 The tree was named as “Kkwangkkwangnamu” because it sounds like "Kkwangkkwang" when its leaves burn. 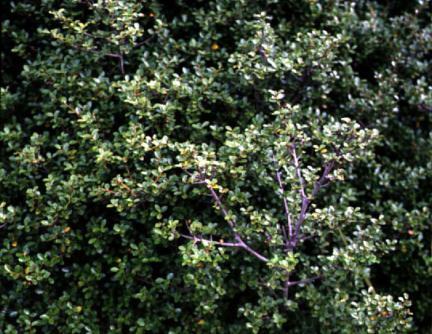 The Population of Box-leaved Hollies grow on a flat place in an upper mountain and the tree is used aesthetically as garden tree, fence, and potted plant. The Population is called Jamdu (head of a silkworm) and according to feng shui, it is considered a very good place. 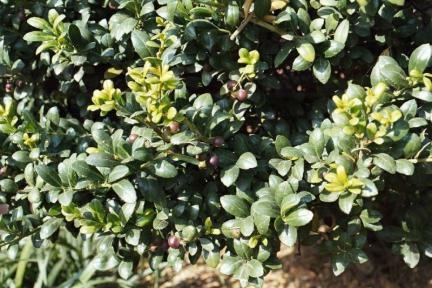 In the past, about 700 trees grew in groups; these days, however, only about 200 trees grow in groups. 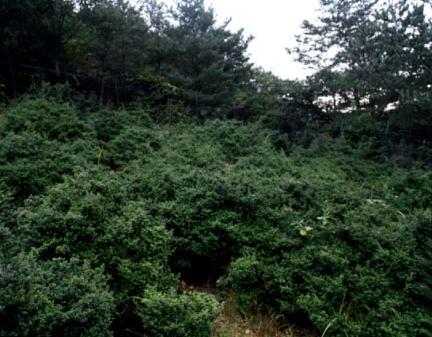 Since the Population of Box-leaved Hollies in Junggye-ri is the northernmost habitat where it can grow wild, it is designated and protected as a natural monument. 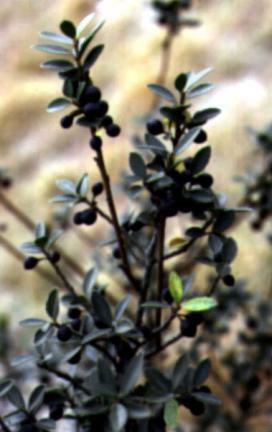 It is also highly valued since it grows on rock, which is a dry place.